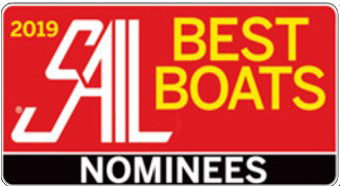 Mark 1 was a game changer, winning multiple awards. 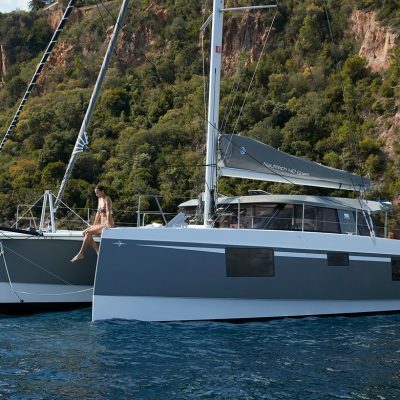 Mark 2 is even better. 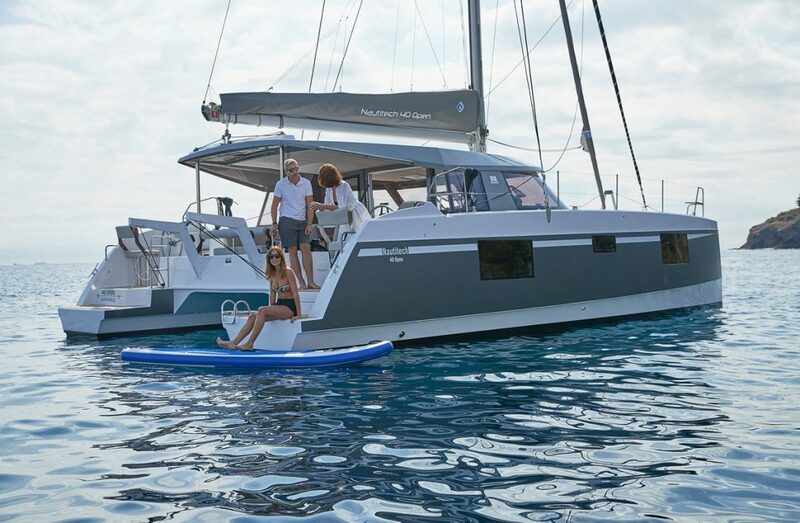 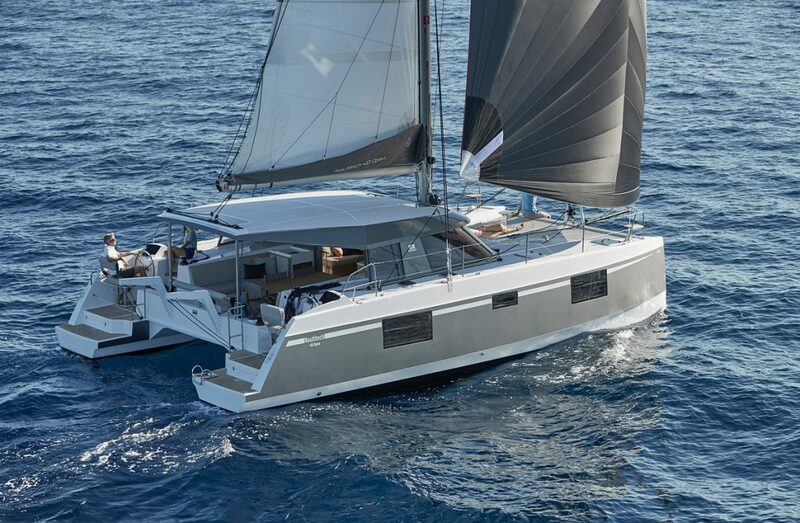 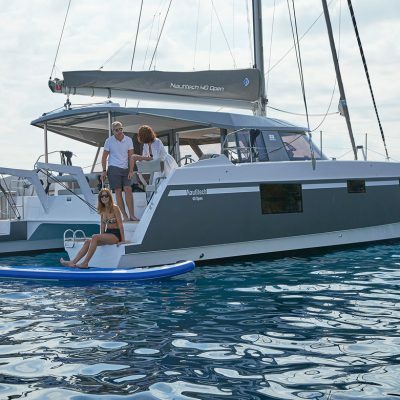 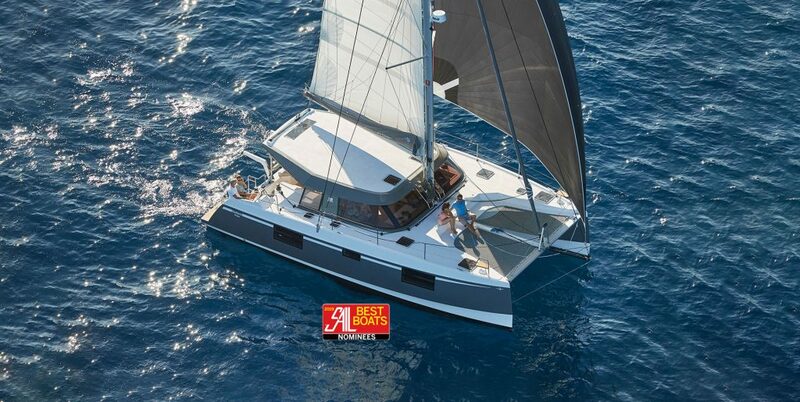 Horizon Yacht Sales presents the Nautitech Open 40 by Nautitech Catamarans, Sail Magazine 2016 Best Boat in Class, Cruising World best multihull cruiser for 2016, in three or four cabin layout. 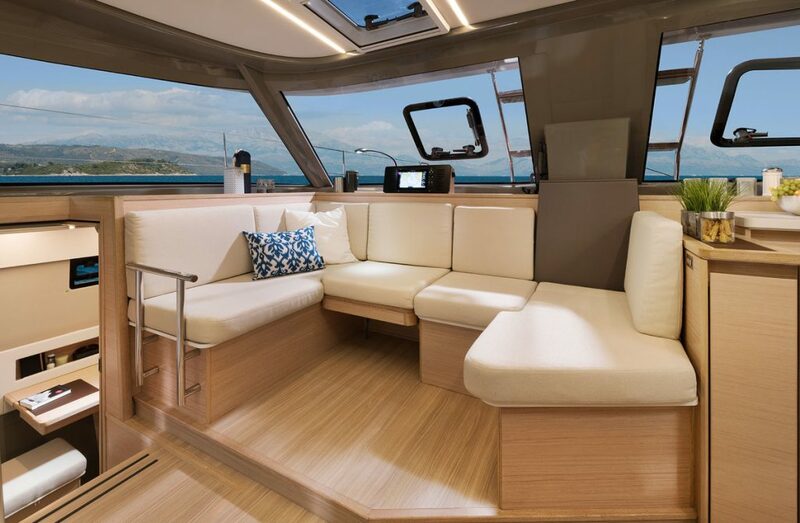 The Nautitech Open 40 harnesses innovative design features that bring together on-board comfort with superb sailing performance. 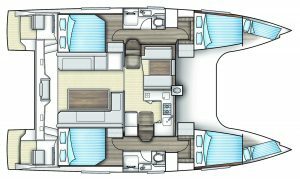 You can read Cruising World’s review of the Open 40 here and Yachting World’s review here. 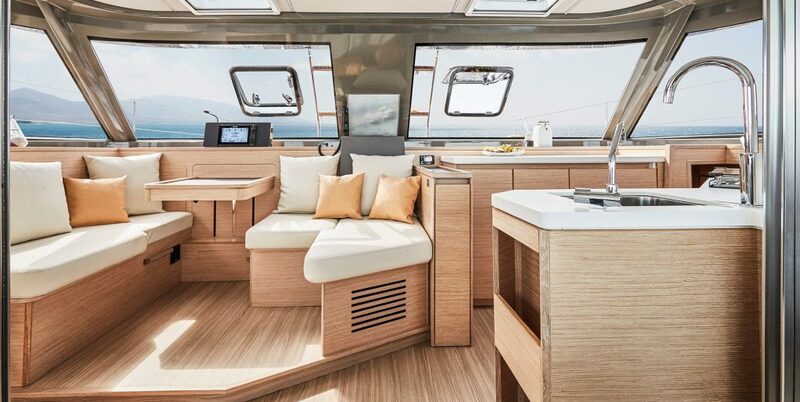 The Nautitech Open 40 construction is first class; different density foam cores are used, in combination with specific laminate specifications depending on the application and loading in different parts of the structure. 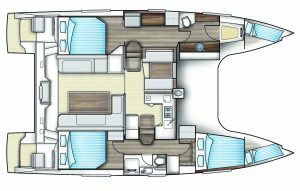 When comparing a typical coach roof helm position versus the Nautitech Open 40 outboard helm position, the following should be considered. With twin helms on the hulls (with a bimini as standard over the starboard helm on the Horizon spec, and an optional one on the port side), you are driving the boat from a position where you have good visibility forward and aft, and you are able to see all four corners of the boat. 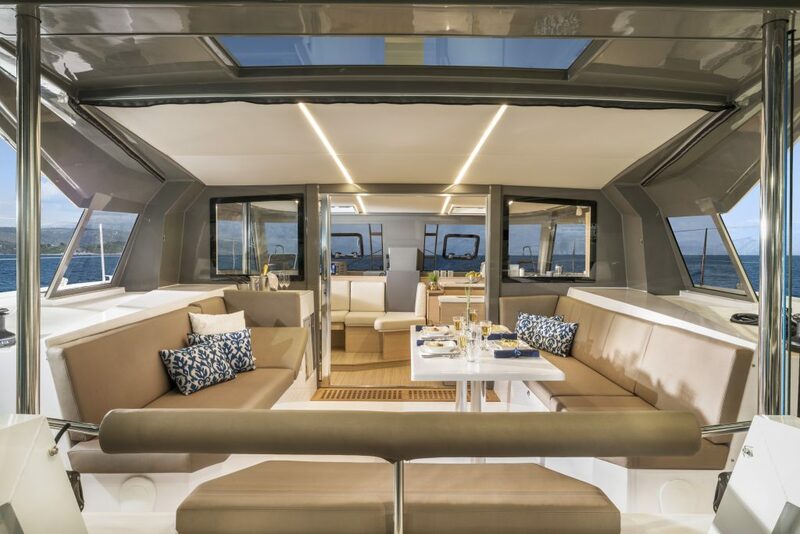 The “Open” 40 name relates to the Voisard- Lombard vision of a sailing/living space unlike any other. 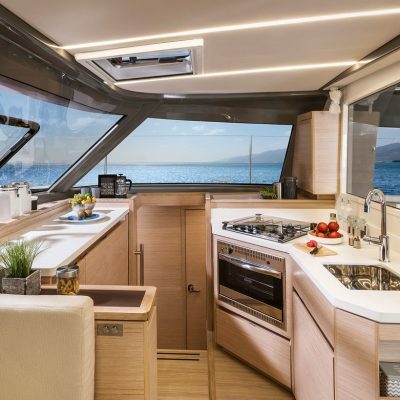 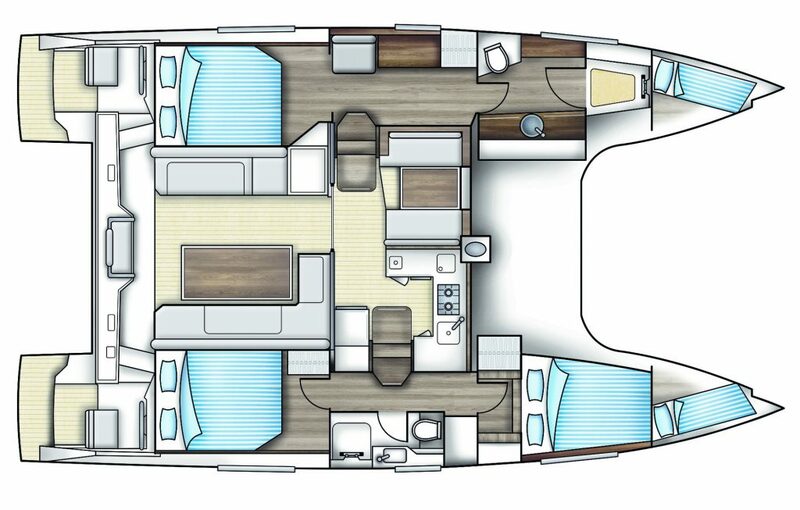 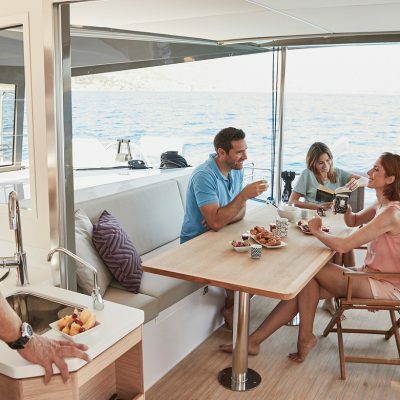 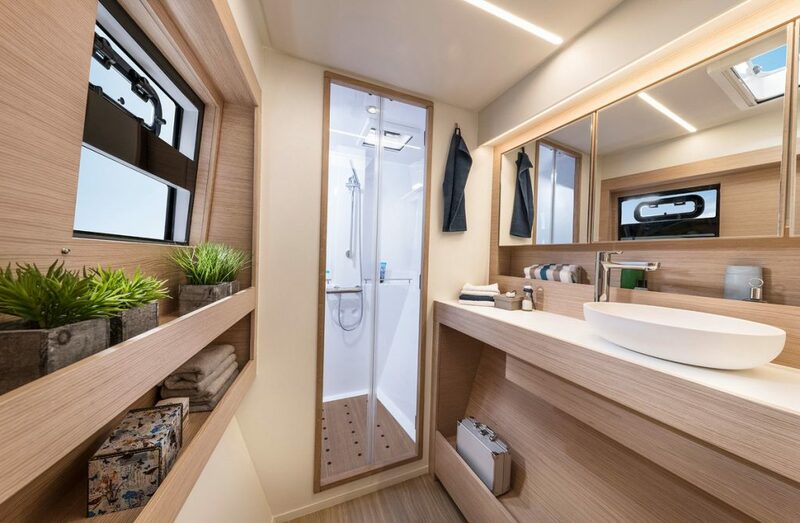 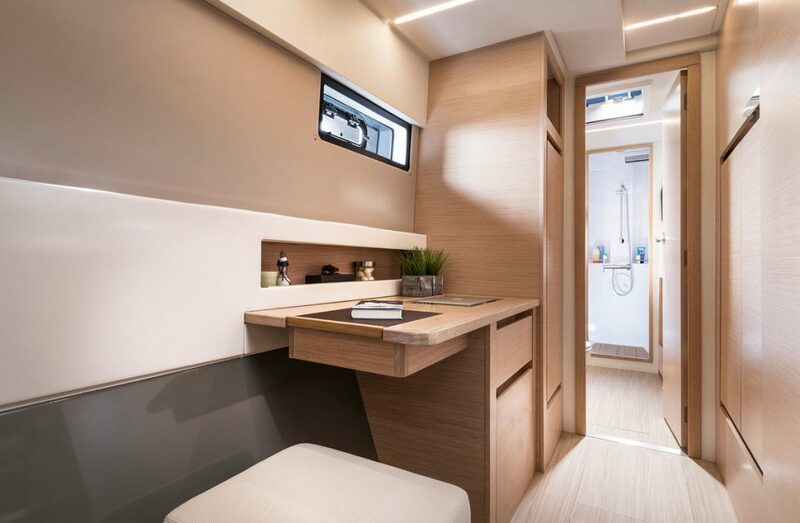 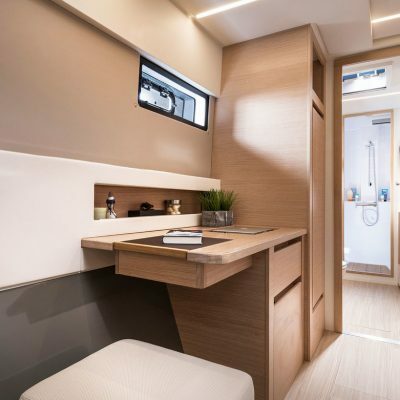 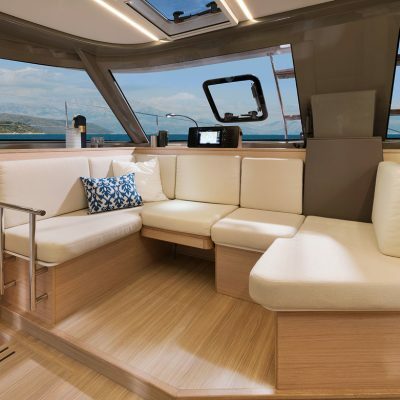 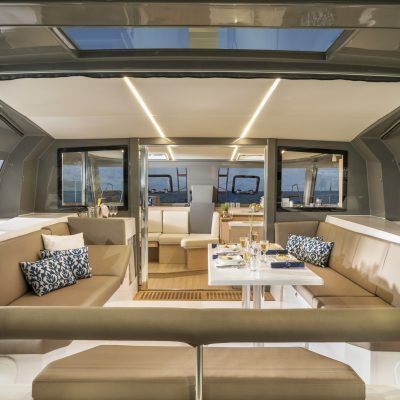 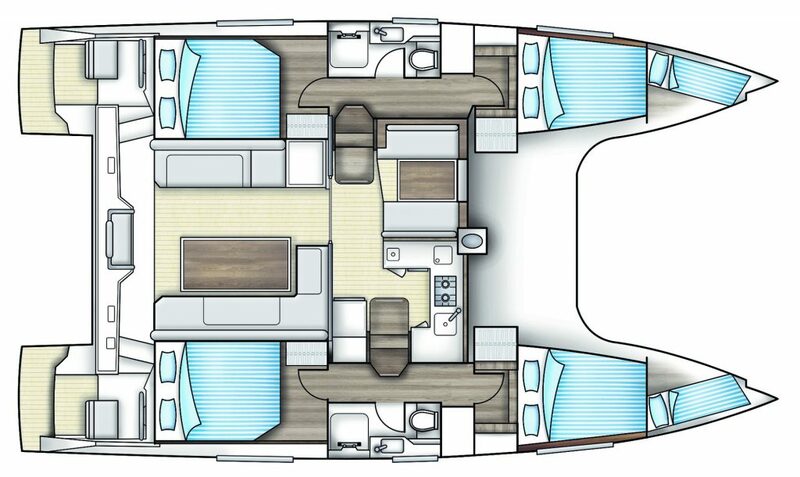 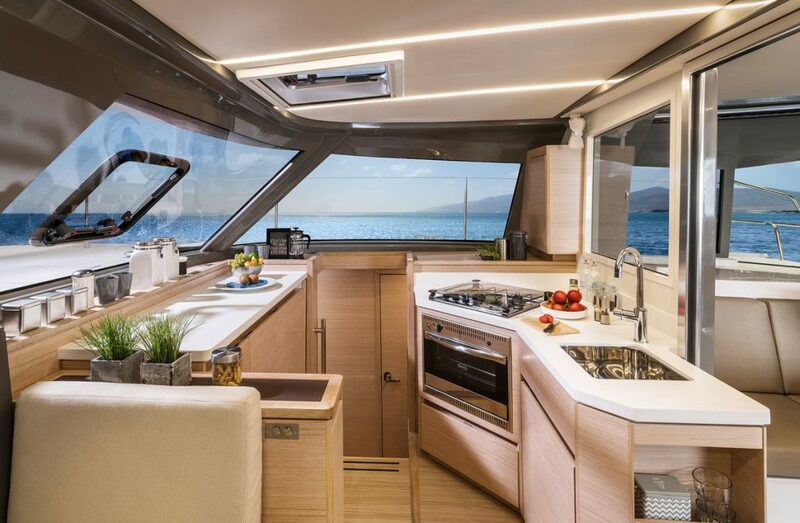 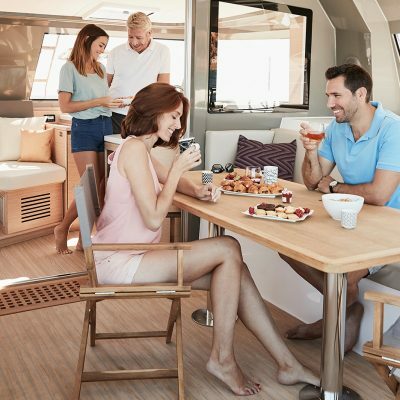 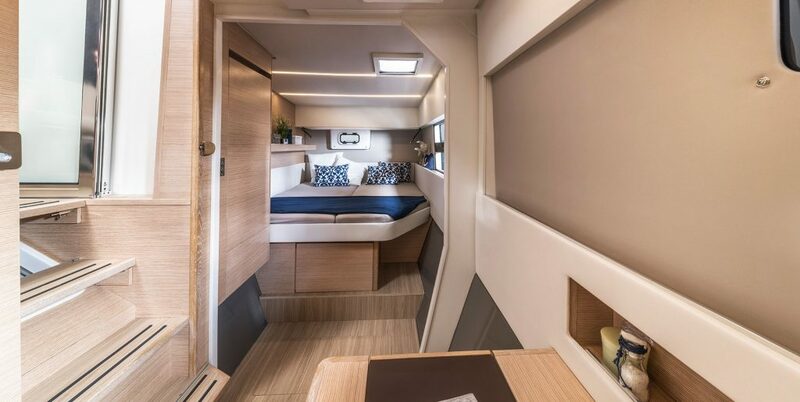 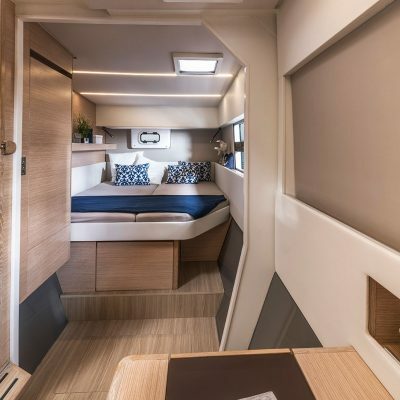 The saloon has an aft facing galley, twin drawer fridge, and a saloon table to seat 6, with integrated navigation station. 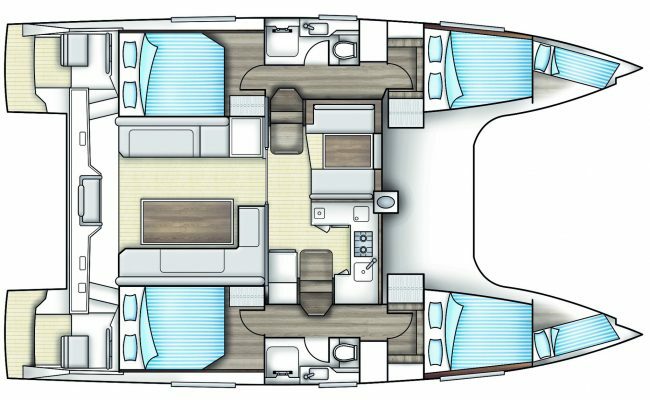 Two large coach roof hatches provide ventilation at anchor (along with two fans, and air conditioning as standard on the Horizon spec). 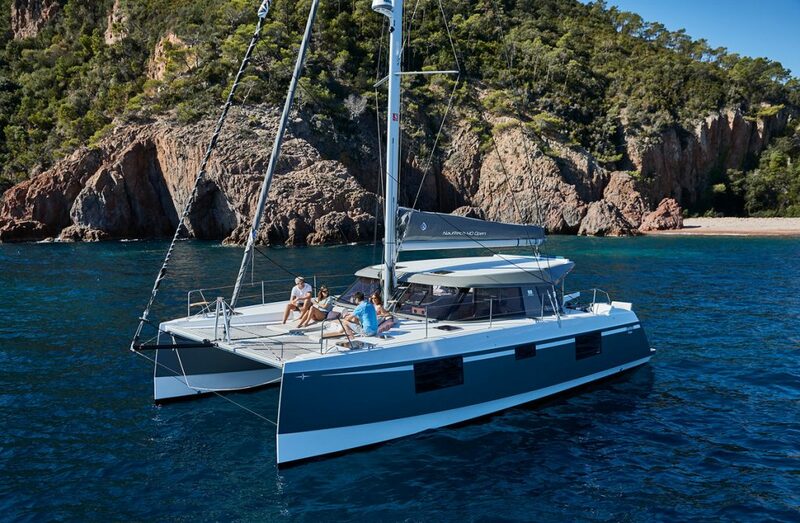 Then you go sailing! 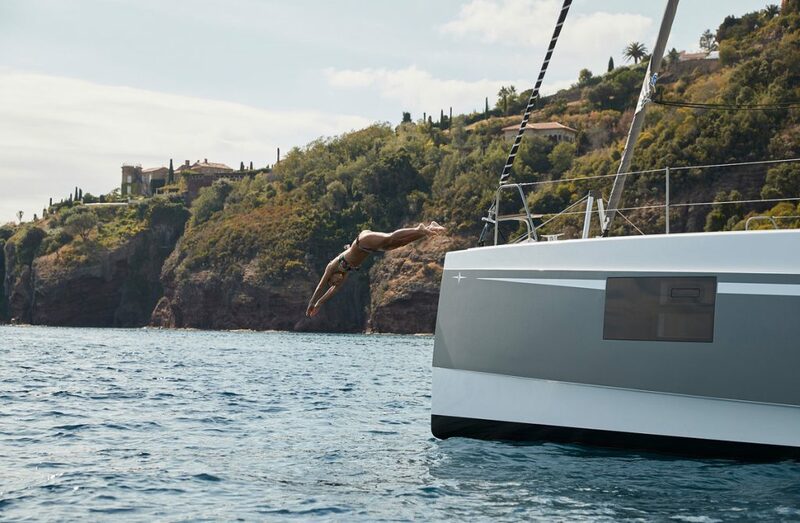 A fathead main ( which does not have to be clipped and unclipped from the track) is hoisted effortlessly with the ( standard Horizon spec) electric winch, and as you bear off, the Solent jib is unfurled and sets beautifully on its self-tacking track. 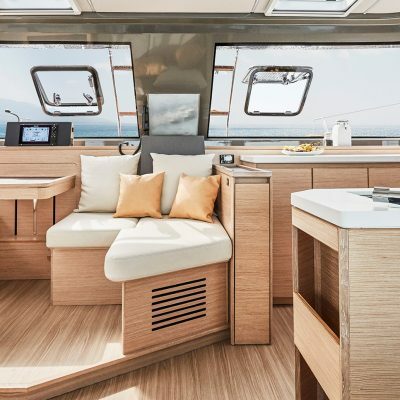 In 7.5 knots of wind, single-handed, without touching a sheet, the cat tacks through 105 degrees and never drops below 3.6 knots during the tack. 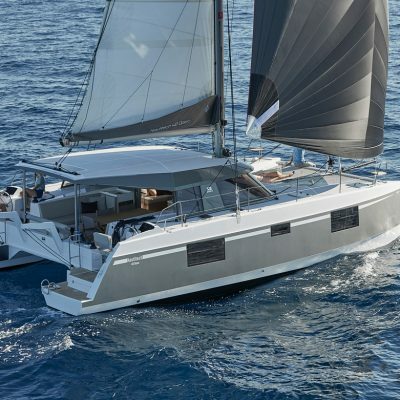 The Nautitech open 40 is an exceptionally well thought out catamaran, with a truly remarkable turn of speed, expert handling to match, and layout options to make her very appealing to charter management and private purchasers alike. 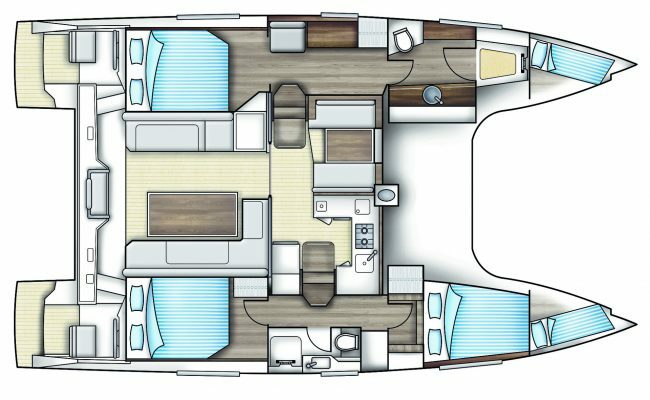 This is a yacht to get truly excited about. 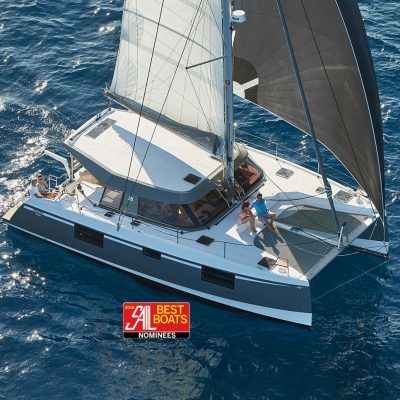 You can read the full review from Sail Magazine here. 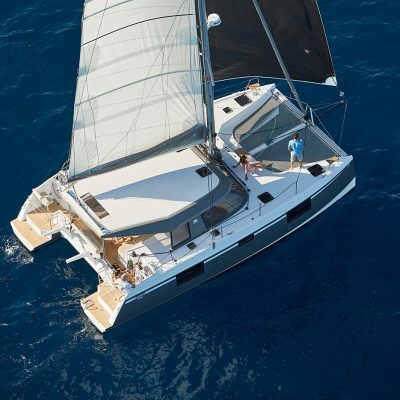 Contact Us to TEST SAIL or CHARTER a Nautitech Open 40! 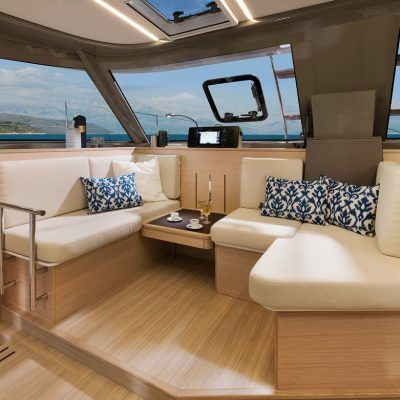 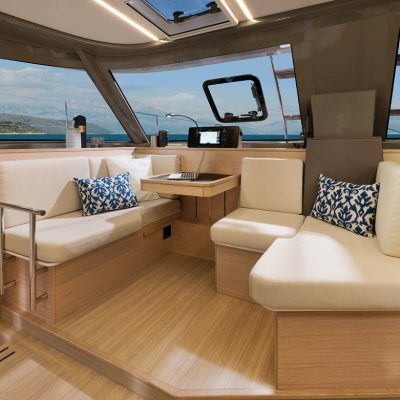 The Nautitech Open 40 is available to purchase to place into charter or to own privately. 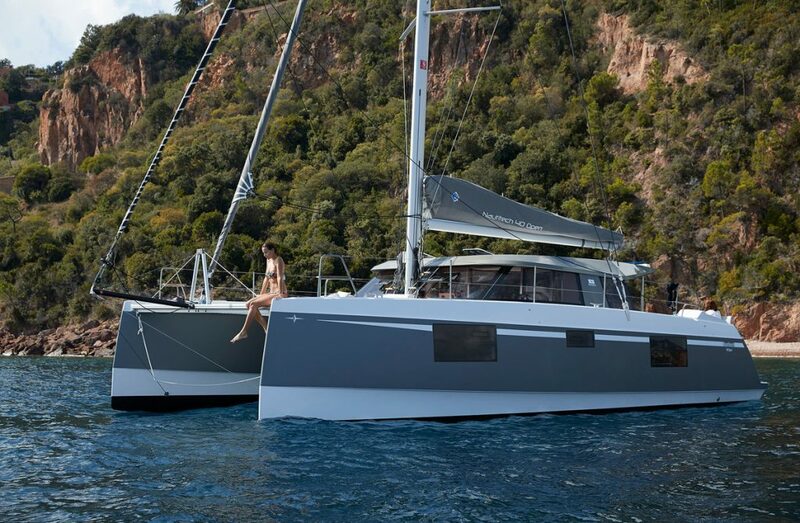 Follow the links for Charter Purchase and Management or Private Purchase. 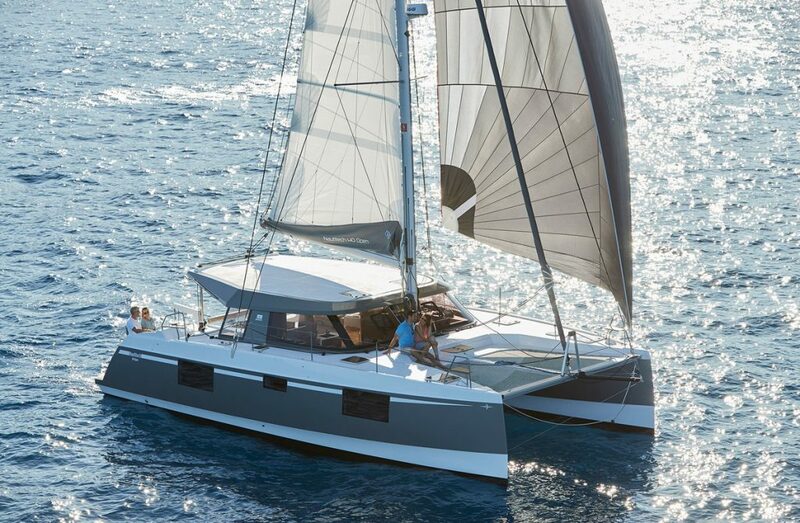 Horizon has been importing Nautitech Yachts into the Caribbean since 2000, and an affiliated company of Nautitech Yachts. 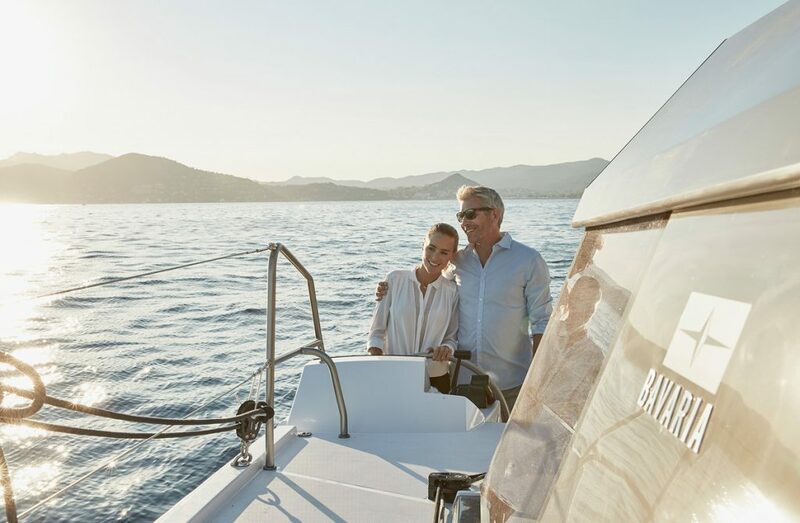 Horizon’s expertise in yacht specifications enables a charter yacht owner, or a private buyer, to benefit from our experience spanning decades in the marine industry. 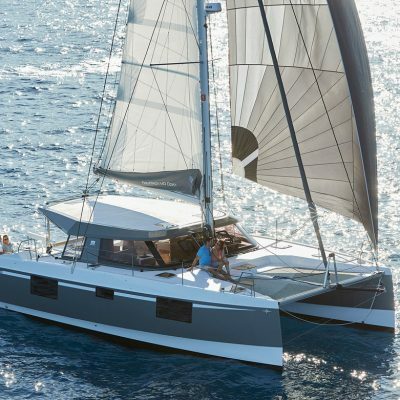 We are pleased to offer a “try before you buy” programme where you can test sail a yacht on a charter with us in the Caribbean. 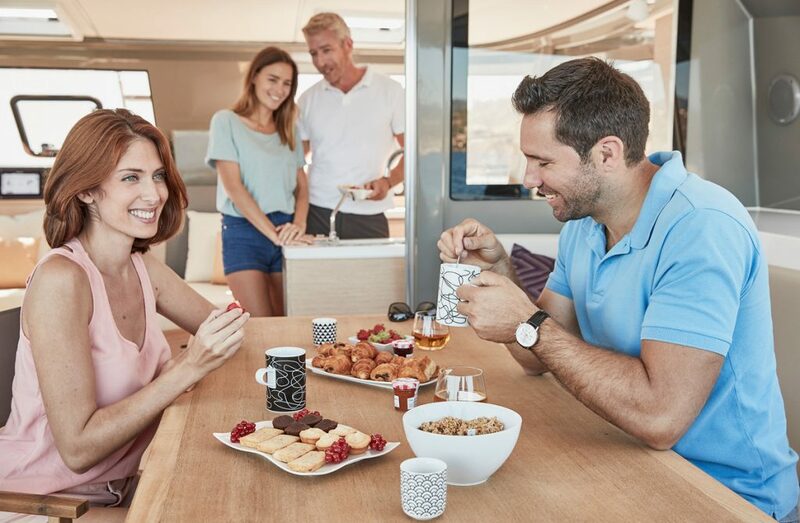 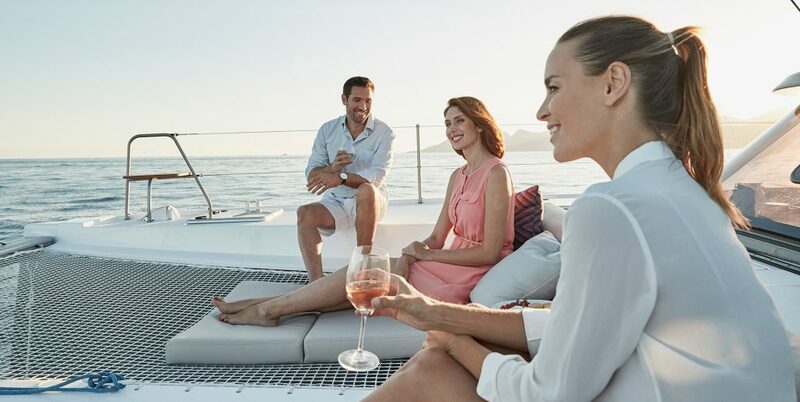 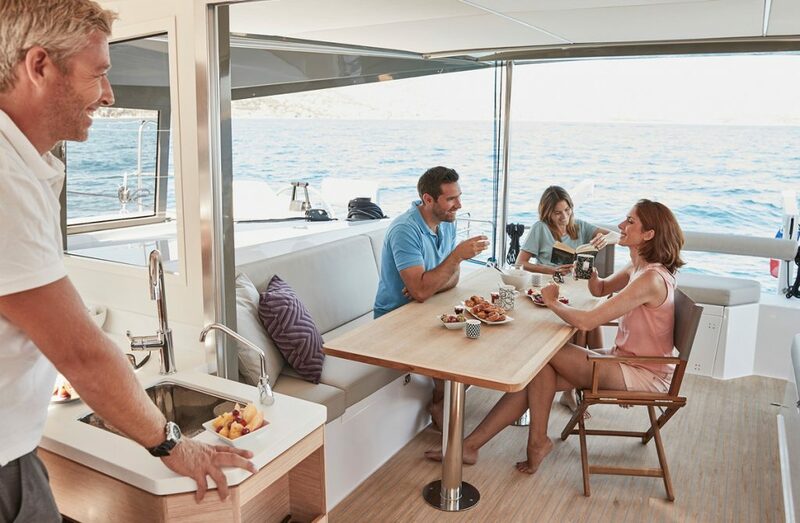 If you subsequently decide to purchase a new yacht within the following three months, we will deduct up to a week’s charter fee from the purchase price. 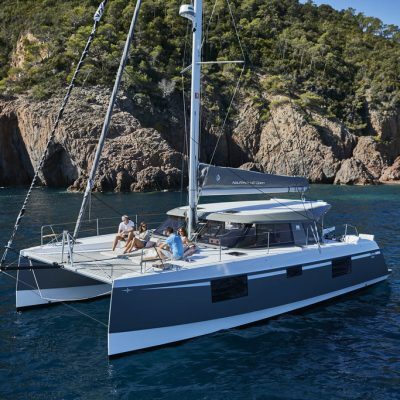 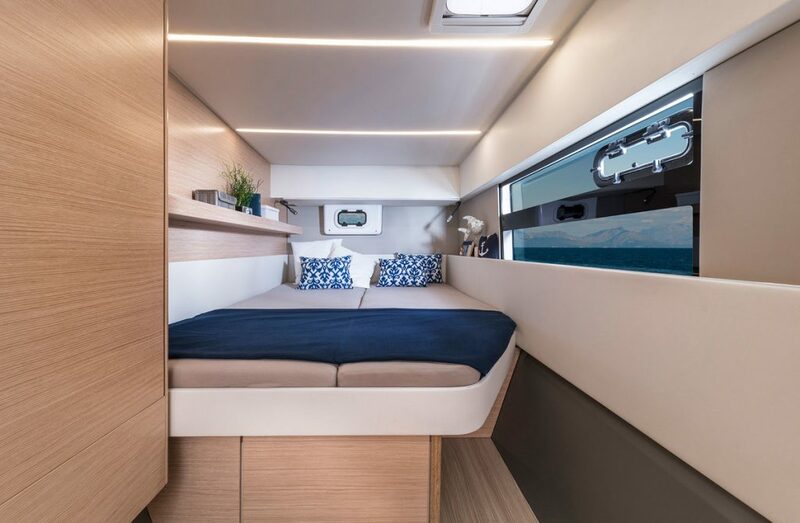 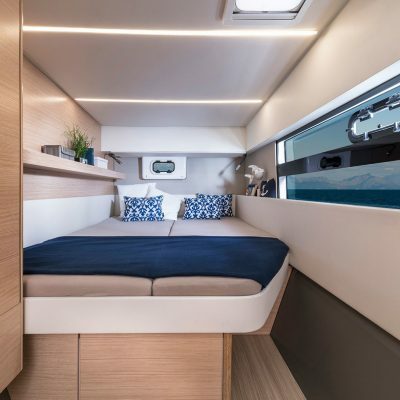 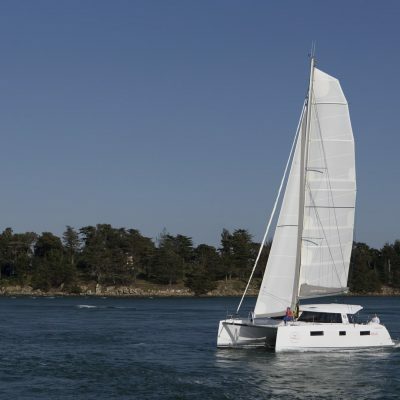 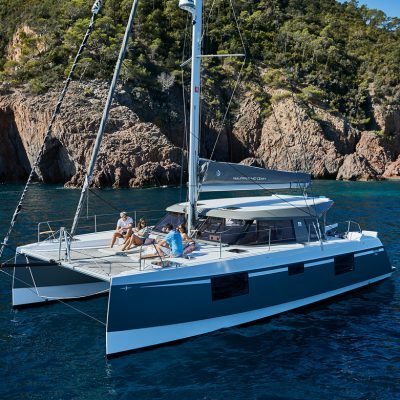 Contact us for more information on the Nautitech Open 40 catamaran.